A launch ceremony and coin exchange have been scheduled for the El Yunque National Forest Quarter. This coin is the eleventh overall release within the America the Beautiful Quarters Program, which features national parks and sites from each of the 50 states, 5 U.S. territories and the District of Columbia. 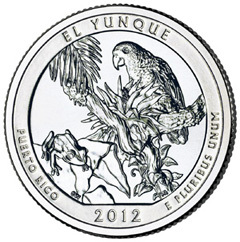 The El Yunque Quarters were first released to the channels of circulation on January 23, 2012. Typically, launch ceremonies are planned to correspond or closely align with circulation release dates, however, the United States Mint was reportedly reevaluating procedures to make sure the ceremonies were conducted efficiently. The reverse design of the quarter depicts a Coqui tree frog sitting on a leaf and a Puerto Rican parrot behind an epiphyte plant with tropical flora in the background. The obverse design contains a portrait of George Washington. The launch ceremony has been scheduled to take place on Wednesday, March 14, 2012 at 10:00 AM (AT) at El Portal Rain Forest Visitor Center in El Yunque National Forest, Rio Grande, Puerto Rico. Attendees will include Rosie Rios, Treasurer of the United States; Pedro Pierluisi, Resident Commissioner, Commonwealth of Puerto Rico; Governor Luis Fortuño; Pablo Cruz, Supervisor, El Yunque National Forest; and Maria Falcon, Producer, Channel 6 TV. Following the ceremony, members of the public will be allowed to exchange currency for $10 rolls of the El Yunque National Forest Quarter at face value.